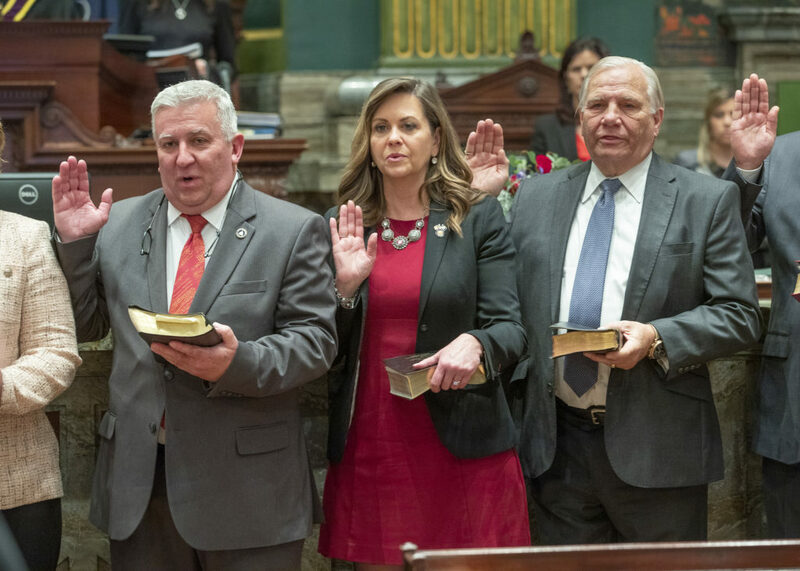 Senator Mensch and colleagues took the oath of office January 1 to begin a new term in the Pennsylvania Senate. This edition of the Mensch Report features my annual Senator for a Day seminar which was held on October 12, 2018 at The Perkiomen School located in Pennsburg. High school students from Boyertown Area, Brandywine Heights, North Penn, Oley Valley, Palisades, Pottsgrove, Pottstown, Quakertown Community, Upper Perkiomen, and the Perkiomen School attended the event, resulting in an impressive turnout of almost 100 students. The Pennsylvania Department of Agriculture approved $1.286 million in grants to 15 Pennsylvania universities and research organizations to advance Pennsylvania’s $135 billion agriculture and food industry. The grants will fund research that aims to combat animal and plant diseases and pests; strengthen farm productivity; improve soil and water quality; protect Pennsylvania’s pollinators and environment; and improve productivity and sustainability for Pennsylvania farmers and food processors. The department gave special consideration in awarding grants to proposals supporting economically stressed dairy farmers, addressing the impact of the invasive Spotted Lanternfly, and bolstering growth trends in urban and organic agriculture. Penn State University will receive $100,000 to evaluate the impact of Spotted Lanternfly on grapevine health to develop more targeted control approaches; $90,000 to identify host tree preference and fitness of Spotted Lanternfly among common woody ornamentals and the implications for host tree health; $90,000 to protect bees from fungicides applied to tree fruits and from insecticides used to control Spotted Lanternfly; $67,000 to explore factors affecting survival of Spotted Lanternfly during the dormant and spring period; and $22,000 to continue research on Phorid Fly, establish a monitoring system for Spotted Lanternfly, and raise awareness of integrated pest management & organic solutions for Pennsylvania’s mushroom farms. Temple University will receive $75,000 to further computational approaches for modeling, predicting, and controlling Spotted Lanternfly invasion and its economic impact. Delaware Valley University will receive $6,000 to research the efficacy of various light traps to monitor the presence of Spotted Lanternfly. Community HealthChoices, or CHC, rolled out starting in Southwestern Pennsylvania 11 months ago. Now, it’s getting ready to come to the southeastern part of the state. CHC is for Pennsylvanians who are both eligible for Medicaid and Medicare, and for eligible individuals 21 and older who have physical disabilities that require long-term services and supports in a nursing facility or in their home. Southeastern Pennsylvanians who are eligible for CHC were notified by mail and asked to select their managed care organization (MCO). Participants who did not make a plan selection have automatically been enrolled in one of three MCOs (Keystone First Community HealthChoices, PA Health & Wellness, or UPMC Community HealthChoices). All participants are able to change their managed care organization at any time, and have until December 21 to make a change if they want it to be in place by Jan. 1, 2019. To learn more about CHC, visit http://www.healthchoices.pa.gov/info/about/community/. Holiday shopping season might be over, but vigilance when using automatic teller machines and gas pump card readers is still a good idea. Illegal card readers attached to payment terminals capture the data from the card’s magnetic stripe or computer chip, leaving no trace of the theft until the victim’s information is used to make purchases. Immediately contact the PA State Police at 717-783-5599 or your local PSP barrack to report the theft of your personal financial and account information through card skimming. A first time conviction for possession, sale, and use of a skimming device is a felony of the third degree, including a fine of up to $15,000 and 7 years in prison. Second and subsequent offenses result in a second degree felony, a fine up to $25,000 and ten years in prison. The Consumer Product Safety Commission (CPSC) announced 15 recalls among the 40 tested toys and children’s products in 2018. The 33rd Annual Survey of Toy Safety reveals from October 5, 2017 to October 26, 2018, over 2.7 million individual toys or products were pulled from shelves. Dangerous chemicals and design flaws create hazards including, choking and asphyxiation for 40 percent of toy-related deaths in children under 15. Accidents on scooters, tricycles, and other riding toys are attributed to 99 deaths. Toxic substances, size requirements, warning labels, flammability, and privacy for internet-connected toys, are among CPSC concerns. Consult the list of recalls in Appendix 4 on page 29. Find free safety alerts, resources, posters, brochures, and handbooks to make toy safety a priority for you and your family.